City as Startup: How are young corporations shaping urban communities? The Fremont East District in Las Vegas, where Zappos is headquartered. Companies shape development in countless direct and indirect ways. But recently, certain organizations have been posing challenging new questions and compelling solutions regarding the place of corporate enterprise and specifically, its many workers, in the context of the urban organism. Several years ago, Tony Hsieh, the CEO of online apparel retailer Zappos, hatched his “Downtown Project” for Las Vegas. Zappos was originally based in Henderson, Nevada and made the move to Vegas in 2012, setting up its new shop in the city’s defunct City Hall building. Hsieh began buying parcels in the area, a struggling neighborhood a few miles north of the Strip. According to the Huffington Post, Hsieh has committed $200 million for real estate, $50 for small business investments, $50 million for education, and $50 million for tech startups— a total of $350 million of the CEO’s own money. Startups seeking the investment dollars are expected demonstrate that they too are invested in the local community, in part by maintaining an office in the vicinity. In a recent essay reflecting on the Downtown Project, filmmaker Ondi Timoner writes, “The bigger the project gets, the smaller and more like a community it feels,” in large part because of how Hsieh’s investments are perceived as a personal commitment on behalf of the exec and a few pals. The Downtown Project website has links to community events, including speakers and family programming, and a running ticker of “jobs created” (597 so far). But it also has a page dedicated to the project’s “Portfolio” of largely tech start-ups. It has its precedents as well as a growing number of contemporary parallels: Ikea’s “Hometown” in Sweden, the Umbrian town revitalized by knitwear designer Brunello Cucinelli, and software company Blueseed’s cruise ship for start-ups, to name the more idiosyncratic examples. And many organizations—especially tech ones oriented toward young employees and young users— make their headquarters into jacked-up playgrounds. But the sentiment at Zappos seems to be very different: here the goal is to build a holistic, sustainable culture and economy, of which its operations and staffers are only partial components. 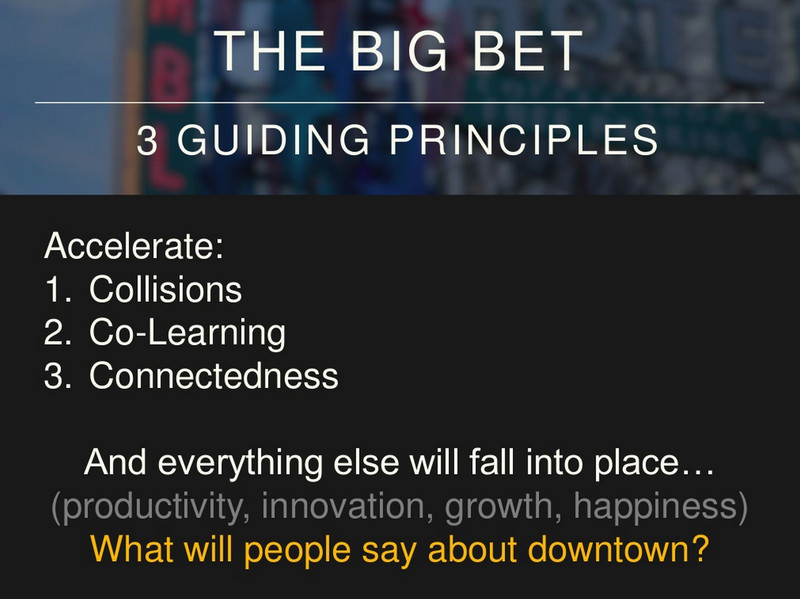 A breakdown of the Downtown Project’s guiding principles, including “return on collisions,” from the Project’s website. This is the tech campus commons reimagined as main street, yet with actual independent businesses and residents and workers of many affiliations. Communities, like companies, can benefit from the exchange of ideas and the inclination for people to channel their social energy into various kinds of innovation. Hsieh’s venture, then, is to affirm the return on this type of investment. As the project progresses, it might provide valuable— though not uncomplicated— take-aways for struggling cities around the country. Meanwhile, in California, Google’s live/work model has generated a minor uprising among San Franciscans. The tech empire’s practice of shuttling its employees from their apartments in the Mission or the Haight to the Google campus in Mountain View is a widely-known and very visible fact of Silicon city life, turning the idea of “bus stigma” on its head. Yet neighbors began to object when they realized that the Google vans were using designated public bus stops as collection points, effectively relying on city infrastructure despite the company’s operating outside of its tax revenue base. Moreover, the occasion brought renewed attention to the concern over gentrification driven by tech industry development in inner San Francisco, recently confirmed to have the highest rents in the country. S.F. designer Eric Rodenbeck‘s map of private bus circulation in the city, via a sharp story on Marketplace. In the wake of the kerfuffle, the city has launched a pilot program that restricts access to Muni stops for private shuttle providers, requiring them to pay for permits to use the stops and to yield to city buses. Google has also recently announced that it will donate $6.8 million to an MTA program that will provide free transit passes to low- and moderate-income youth. When weighed against the gross of these companies and particularly against the cache of a city like San Francisco in drawing smart, creative employees, these fees seem miniscule. To be sure, Las Vegas’s particular character and Tony Hsieh’s singular personal commitment are a distinctive model. Clearly, the economic impacts of companies go far beyond these measures, and the complexities of rapidly-growing tech firms’ influence on employment and local income distribution are certainly the more important testament. Yet these narratives are worth reflecting on, for what they suggest about how various corporate philosophies and cultures come into play within the social and political landscape of their individual places.